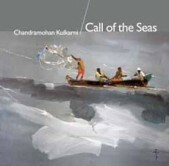 For Chandramohan Kulkarni, Pune (Maharashtra, India) has been home ever since he was born there. Whether it is the artistic merits, or the thought behind his paintings, his art has come a long way. His paintings have revealed a richness of content and his unique way of looking at human beings, their relationships and turbulent dreamlike state of subconscious mind. His style, which is by nature unbound, cannot be fit into rigid compartments; nor has he allowed himself to be fettered by technicalities. Most of his work has been shown through individual and group exhibitions at eminent galleries. preserved at the Imperial War Museum , U. K. He has also done illustrations and book covers for Oxford University Press, U. K. He has set high standards in illustrations for children's books. 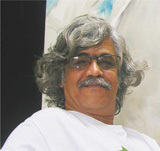 For more than three decades, he has freely roamed the realms of drawing and painting, sculpture, photography, typography, calligraphy, editorial art, graphic art, digital graphics, art direction, writing, print media and advertising. His work is making its mark even in the newer fields of electronic media and theme parks.